Chapter 5, How Do Neurons Communicate and Adapt? 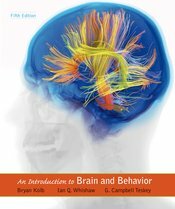 From authors Bryan Kolb and Ian Whishaw, and new coauthor G. Campbell Teskey, An Introduction to Brain and Behavior offers a unique inquiry-based introduction to behavioral neuroscience, with each chapter focusing on a central question (i.e., "How Does the Nervous System Function?"). It also incorporates a distinctive clinical perspective, with examples showing students what happens when common neuronal processes malfunction. Now this acclaimed book returns in a thoroughly up-to-date new edition. Founders of a prestigious neuroscience institute at the University of Lethbridge in Alberta, Canada, Kolb and Whishaw are renowned as both active scientists and teachers. G. Campbell Teskey of the University of Calgary, also brings to the book a wealth of experience as a researcher and educator. Together, they are the ideal author team for guiding students from a basic understanding the biology of behavior to the very frontiers of some of the most exciting and impactful research being conducted today. The new edition also has its own dedicated version of Worth Publishers’ breakthrough online course space, LaunchPad, giving it the most robust media component of any textbook for the course. "I believe that the distinguished co-authors and the book production team have again done a fine job of making the complexity of brain-behavior relationships widely accessible."